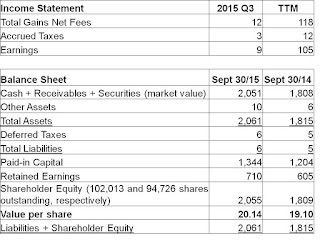 For the third quarter ended September 30th, 2015, KVF gained $0.08 per share, increasing the value of each share to $20.14. This quarter's returns were propped up by currency gains, however, to the tune of $0.59 per share. Without these gains, the portfolio's return was -2.5%. 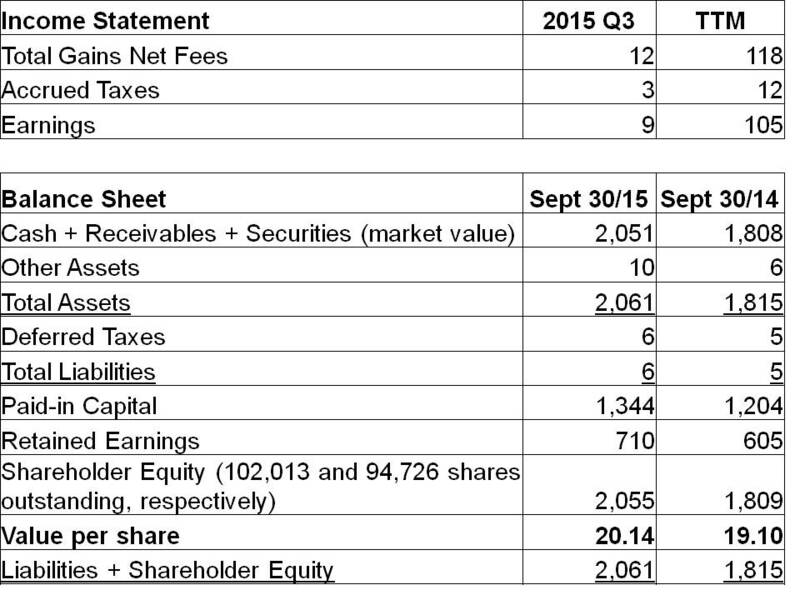 While this is an uninspiring absolute return, it was actually an excellent quarter for a couple of reasons. First, this was a strong relative return. Global indexes were down across the board. The S&P 500, the TSX and the Russell 2000 were all down between 7% and 12%. Second, KVF's potential to generate long-term returns likely grew this quarter. KVF entered the quarter with a significant cash position, a good chunk of which was put to work at much more attractive prices this quarter than were available in the recent past. As a result, I'm more excited about KVF's ability to generate good absolute returns in the long-term than I have been in some years. For years, KVF has avoided companies in commodity industries (e.g. oil/gas, mining) like the plague. This is because volatile prices for the underlying commodity make it difficult to determine if a company in the space has a margin of safety. This philosophy no doubt explains a good portion of KVF's outperformance this quarter, as prices for many commodities have plunged. As a result, margins of safety for many companies in commodities industries have become easier to identify as industry outputs have stopped increasing or have declined due to the incentives resulting from lower prices. While KVF does not own any drillers/miners, it now does own companies in the space that either have flexible cost structures and trade at low multiples, or have assets that can be sold (in many cases, to companies outside of commodity industries) at attractive prices relative to the share prices. Buying when everyone else is selling has worked well for KVF so far, and I expect that strategy to continue to do well.